Justin Ward's company, Patient Advocates in Gray, helped Hardwood Products in Guilford connect some of its employees by video conferencing with a diabetes specialist at Tufts University, the first use of telemedicine by a company in Maine. Jeff London takes a break from his job at Hardwood Products & Puritan Medical Products in Guilford to sit down for a consultation with Dr. Richard Siegel, co-director of Tufts Medical Center's Diabetes Center, by video conference. 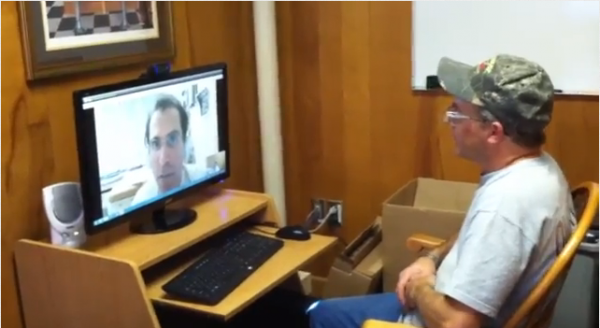 It's being called the first time telemedicine has been used in the workplace in Maine. GUILFORD, Maine — Diabetic employees of a wood products company in Guilford had the opportunity last month to sit down for one-to-one consultations with a world-class diabetes specialist from Tufts Medical Center in Boston. No one, however, had to take time off from work to make the eight-hour round trip for a visit to the doctor’s office. It was all done online, using video conferencing technology, in what’s being called the first time a Maine business has used telemedicine in the workplace. Hardwood Products & Puritan Medical Products Co. employs roughly 420 people and manufactures products such as popsicle sticks and wooden skewers on the Hardwood side of the business, to myriad types of medical swabs and tongue depressors on the Puritan side. It is self-insured and has worked for several years with a company in Gray called Patient Advocates, which manages the company’s health plan and helps its employees navigate the health care industry. Patient Advocates’ goal is to “remove obstacles to quality care,” said Justin Ward, the company’s director of client services. The telemedicine consults took place on Oct. 11 and allowed seven employees to sit down virtually with Dr. Richard Siegel, co-director of Tufts Medical Center’s Diabetes Center, while guided by one of Patient Advocates’ nurses in a private room at Hardwood & Puritan. The idea behind the telemedicine program is to improve employees’ access to specialized health care services and reduce health care costs for the company, according to Scott Wellman, chief financial officer of Hardwood & Puritan. Wellman expects there to be as many as 25 employees in the program as it expands. Hardwood & Puritan’s use of telemedicine in the workplace is a first for Maine, according to several experts in the field. But it’s a trend being seen more and more throughout the country, according to Mary Modahl, senior vice president of American Well, which provided the secure, cloud-based telemedicine software Patient Advocates used to connect Hardwood & Puritan’s employees to Dr. Siegel. “It’s very much a hot topic among large employers,” Modahl said. The airline industry has used it to connect pilots and stewardesses with physicians while they were on the road, she said. And large financial services firms have used the technology to save employees a trip to the doctor and an afternoon lost at work. In 2013, 17 percent of midsize and large companies plan to offer telemedicine, and another 27 percent are considering it for 2014 and 2015, according to a survey of 440 midsize and large U.S. companies released in October by professional services firm Towers Watson. 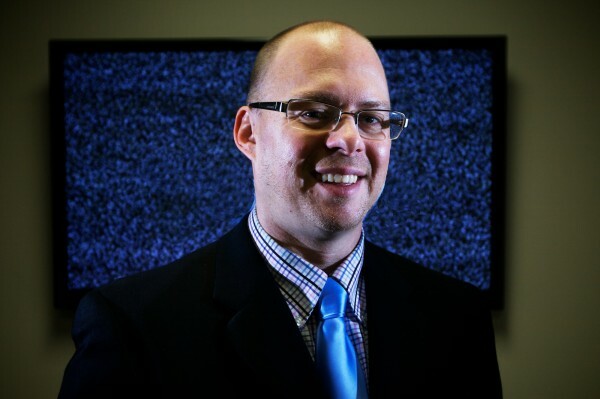 Over the years telemedicine has gone through a number of iterations, including several technologies that failed to improve rural access to health care, according to Andrew Coburn, a rural health care expert and associate director of the Muskie School of Public Service at the University of Southern Maine. “But as technology becomes more accessible and less expensive … it’s becoming a lot more feasible to extend or connect rural people to all kinds of health resources that are pretty far away,” Coburn said. Hardwood & Puritan’s telemedicine program grew out of a wellness program Patient Advocates had set up for the company in 2009. Enrolled employees underwent two health screenings a year and received premium rebates if they improved their health. The data collected revealed that 5 percent of “covered lives,” including employees’ family members covered under the company’s plan, were diabetic or prediabetic, and that the majority were not getting the level of care they needed, Wellman said. The reasons behind the lack of proper care were twofold, Wellman said. While diabetic employees were seeing primary care physicians, they were not exposed to diabetes specialists, who are lacking in the region, Wellman said. The second reason was financial. Employees were deciding they couldn’t afford the deductibles they’d need to pay for specialized care. When Patient Advocates presented telemedicine as a way to address the issues, Hardwood & Puritan took the plunge, Wellman said. “I think it’s a good sign that we have businesses such as [Hardwood & Puritan] that are focused on getting a handle on employee wellness and understanding that to the extent we can address complex health issues like chronic disease, workers are going to have lower absenteeism and higher productivity than would otherwise be the case,” Coburn said. Diabetes is a major issue in the country. Health spending associated with diabetes and prediabetes is expected to increase from the $198 billion spent in 2010 to $500 billion in 2020, according to the Diabetes Prevention and Control Alliance. The potential of telemedicine doesn’t stop with diabetes, according to Ward. It was the chronic illness most affecting Hardwood & Puritan’s employees, but in the future, specialized services could be offered to cover other issues such as orthopedics and dermatology, according to Ward. But questions remain about the effectiveness of telemedicine, how insurance companies handle it and how smaller businesses can leverage it to improve employee health. It’s too early to have concrete results, but within a year shifts in Hardwood & Puritan’s per-employee health care costs should begin to appear, Ward said. To that point, Ward at Patient Advocates and Dr. Siegel from Tufts both said as the program grows it will seek to include more local resources, such as nutritionists and pharmacists. And, in anticipation of concerns that this type of program competes with local health care providers, Ward argues it will do the opposite by creating awareness for employees and giving them a health care plan they can act on. After the initial consultations, Dr. Siegel, who had to get a Maine license to conduct the consultations, forwarded his notes and recommendations to each employee’s local primary care physician. While telemedicine in the workplace has, so far, been the territory of large businesses, work should be done on extending those capabilities to smaller businesses that might not have the resources or dedicated human resources staff to handle such an initiative, Coburn said. Perhaps chambers of commerce could act as an aggregator to bring geographically close small businesses together to take advantage of telemedicine services, suggested Marianne Lynch, coordinator of the Maine State Telehealth Conference. There are also various local wellness councils that could aggregate and offer such services to its members, said Matt McLaughlin, the Wellness Council of Maine’s interim executive director. Currently, working with Patient Advocates is the only way Maine businesses would be able to take advantage of American Well’s telemedicine solutions, said Modahl. But the company does partner with insurers, hospital systems and retailers, so in the future, we’re likely to see a variety of telemedicine services in Maine, Modahl said. While it’s still too early to estimate the effect of telemedicine, people agree leveraging the technology to improve rural access to health care and to lower business’ health care costs is a move in the right direction.